Two years ago, I joined the crusade to help business owners, CEOs, CFOs, and CHROs (i.e., CXOs) discover the business strategy of “engagement” and the science of behavioral economics as a way to improve business performance. If you are buying or selling a dealership, or are simply looking for ways to improve profitability and performance, engagement can give you a way to validate value and give you a competitive edge. Engagement is defined as discretionary effort. That refers to that extra bit of effort an employee exerts to do his or her job better. 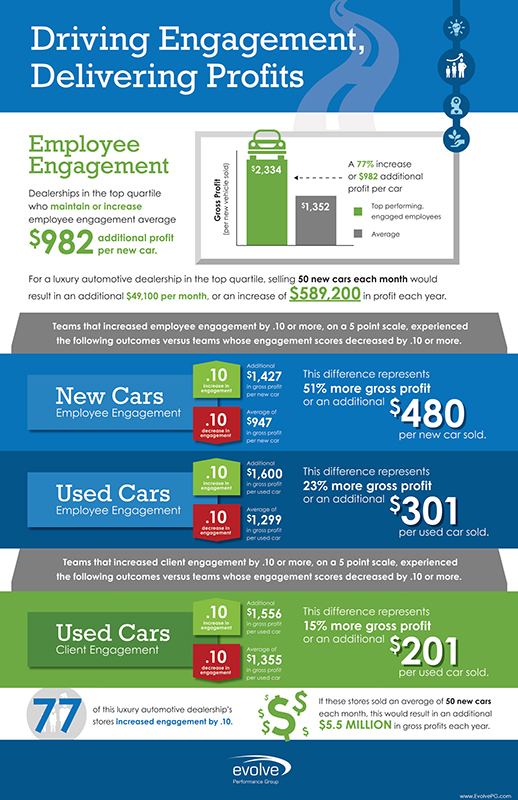 When an employee is engaged, he or she is personally invested in the success of your dealership’s customer experience. A great customer experience creates customer loyalty, and customer loyalty means higher profits. The stock of companies with high employee engagement scores outperforms those that don’t. Our research and experience show it’s the same for auto dealerships. The connection to value is obvious. The disconnect as to why there is inaction or inadequate action by dealerships is not. Be your own survey – do you measure engagement, is it improving and is your program tied to financial/team/individual performance? Just as seat belts were an option to wear years ago, they are now the norm. The same will be true with employee engagement strategies. And here comes the one-two engagement punch. On one hand, the new International Standards Organization’s (ISO) 10018 and 9001 certification programs will standardize and improve management quality and reinforce the need for engagement strategies. On the other hand, the request for new human capital/engagement data/audit requirements is being driven by the investment community to the front door of the Security and Exchange Commission (SEC). For some, determining the actual value of the intangible people asset is difficult. In 1978, 80% of a company’s value was easy to enumerate. It was mostly tangible assets such as factories and equipment. Today 80% of a company’s value is comprised of intangible assets such as brand value, intellectual property, and people. The Who, What, When, Where, Why and How much of engagement? Consider an integrated employee engagement program as an underlying management quality process. It’s not more work, it becomes how you work. It’s not an event, it is an ever-evolving evolution of a business strategy. It’s not a theory, it’s the execution of that strategy linked to the financial and people leadership goals set by the CXO, ISO, the board, or investors – to improve business value (see Figure 1). As an example of how an employee engagement program might work, we start with a strategy discussion with leadership. We identify symptoms of possible employee disengagement such as turnover, safety, or low productivity and link the dealership’s financial metrics to our survey so we can measure and quantify improving engagement. We then conduct a confidential employee engagement survey for all employees. We provide manager engagement training so they can understand the survey data and make recommendations and actions plans for correcting disengagement. As part of the engagement program, we provide a portal for ongoing communication, reinforcement and of learning, and accountability. As awareness and acceptance of the costs of disengagement increase it will be interesting to see who will own the fiduciary responsibility, take the leadership role, and exhibit the professional and personal integrity to implement employee engagement strategies –to improve and prove business value. The effort can be led by; 1) the CXO and his/her team, or 2) maybe it is best prescribed by the Board, portfolio manager or investors.